Traditional Carousel Ride for hire. 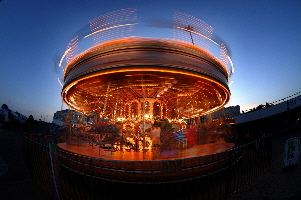 Although the Carousel is a traditional fairground attraction, Better Rides’ Carousel is actually a modern ride and as such carries all modern operational equipment and safety features. For very young riders or the less mobile, our carousel features the ornate Dragon Carriages, which offer spacious bench seating and are motion-free. Children and adults alike are all able to ride and enjoy this charming attraction. Is there enough space? 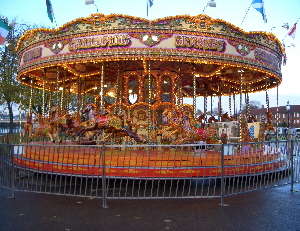 The Carousel measures 12m in diameter or 14m including the surrounding barrier fence. There is also a 1.5m operators booth. The ground should be fairly level and hard standing. 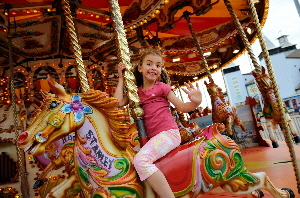 Whilst the Carousel does not feature any fast or sudden movements, you are required to hold on when riding a horse. Very small children may be required to ride on an inside horse with an adult or in a carriage. Measuring charts are available around the ride to check heights and indicate appropriate seating. Is there room to maneuver? The vehicle is approximately the same length as a standard supermarket lorry. You will need to think about access roads, gates and space within the site itself. The Carousel is available to attend public events, for private hire or corporate branding and sponsorship campaigns around the World.